Leeds registered their third win in four games as they beat 10-man Preston. Preston had goalkeeper Jordan Pickford controversially sent off after he was adjudged to have handled outside his penalty area after 30 minutes. Less than a minute after half-time, Leeds went ahead when Preston's Alan Browne headed past Pickford's replacement - 17-year-old Matt Hudson. North End substitute Neil Kilkenny forced three saves from Marco Silvestri as they pressed for an equaliser. The victory sees Leeds go above Blackburn and Nottingham Forest into 13th place in the Championship, while Preston stay in 16th. Preston, whose manager Simon Grayson was returning to Elland Road for the first time since being sacked by Leeds in February 2012, started brightly and forced home goalkeeper Silvestri in three fine saves in the opening 10 minutes as Paul Gallagher, Will Keane and Joe Garner all went close. Pickford made an excellent save with his legs from Liam Bridcutt before being at the centre of the game's most controversial moment. Chris Wood chased Scott Wootton's ball over the top and Pickford raced out of his area to intercept. The ball came into contact with what he claimed was his shoulder, but referee Gavin Ward disagreed and sent him off for a deliberate handball. 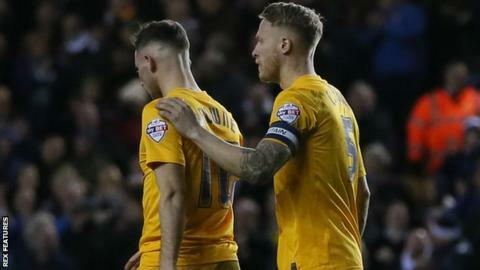 Hudson, who was playing for Preston's youth team against Accrington Stanley on Friday, came on to make his debut as a replacement with former England goalkeeper Chris Kirkland unavailable due to illness. Thirty seconds after half-time, Hudson conceded for the first time in his career after Stuart Dallas' cross skewed off the head of Browne and into his the back of his own net. Despite having a goal and a man advantage, it was Preston that went on the offensive, with Kilkenny forcing Silvestri into three more good saves, including two which were acrobatically tipped over the bar. "It was going to have to be a gritty performance. "We got back from Wolves at 03:30 GMT after Thursday's game so it was always going to be tough. "I think Marco Silvestri is just getting better and better and he made some big saves for us." (On scoring eight goals at home this season): "We're making chances now but if you offered me a 1-0 home win every week then I would take it." "The referee makes a decision that he deemed was the right one. "My goalkeeper's said it hit him in the chest area. The assistant referee says the defenders weren't round on the cover, but I felt they were going to get round to it. "It's a huge decision at an important part of the game. It's gone against us and ultimately cost us the game." Match ends, Leeds United 1, Preston North End 0. Second Half ends, Leeds United 1, Preston North End 0. Substitution, Leeds United. Kalvin Phillips replaces Stuart Dallas. Corner, Leeds United. Conceded by Paul Huntington. Neil Kilkenny (Preston North End) is shown the yellow card for a bad foul. Corner, Preston North End. Conceded by Liam Cooper. Substitution, Preston North End. Eoin Doyle replaces Will Keane. Corner, Preston North End. Conceded by Marco Silvestri. Attempt saved. Neil Kilkenny (Preston North End) header from the left side of the box is saved in the top centre of the goal. Assisted by Adam Reach with a cross. Attempt saved. Marnick Vermijl (Preston North End) header from a difficult angle on the left is saved in the top right corner. Assisted by Adam Reach with a cross. Adam Reach (Preston North End) is shown the yellow card for a bad foul. Greg Cunningham (Preston North End) wins a free kick in the attacking half. Attempt saved. Neil Kilkenny (Preston North End) right footed shot from outside the box is saved in the top centre of the goal. Assisted by Marnick Vermijl. Paul Huntington (Preston North End) wins a free kick on the left wing.